A coalition of faith-based charities have formed ‘Christians Together Against Loneliness’ to tackle isolation amongst older people – and have launched a new resource to encourage community meal initiatives. The partner organisations backing the resource include Livability, The Salvation Army, Linking Lives UK, Pilgrims Friend, Torches Trust, Parish Nursing Ministries UK, Care Home Friends and The Gift of Years. The coalition is launching a resource called ‘Make A Meal Of It’, which supports churches and local agencies to run a community meal with older people. In recent years, community meals have grown in popularity. Events such as ‘The Big Lunch’ or ‘The Great Get Together’ have provided new opportunities to make contact with people – offering opportunities for new contacts and friendships. The aim of ‘Make A Meal of It‘ will have a particular focus on mobilising churches to connect with older people on the margins. • 41% of people aged 65 and over in the UK feel out of touch with the pace of modern life and 12% say they feel cut off from society. ‘Make a Meal of It’ offers a fresh take on the community meal by challenging churches to plan to build relationships on an ongoing basis and avoid offering just a ‘one-off’ event. For many elderly people, who are battling with isolation, creating connections takes time, trust and confidence. 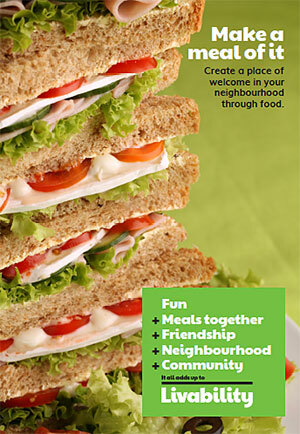 Make A Meal Of It is focused on a longer term view in befriending and providing support. The resource helps groups think about developing the voice and involvement of those who are coming. The pack contains advice for every stage of the process – ideas on how to plan the meal, who to involve, how to connect, creative ideas on the day, and ideas for follow up. Churches are encouraged to think how a meal could involve a broad range of people from the community at a day where everyone gets to take part. "A community works best when it’s made up of people from many different backgrounds. We’re keen for a wide range of people to come along to a meal where they can celebrate life together, old and young. It’s important that no-one feels ‘labelled as lonely’ but instead knows they are being invited to be part of something that is good for everybody," says Corin Pilling, Deputy Director Public Engagement at Livability. And Jeremy Sharpe, Director at Linking Lives UK, adds: "Many older people have lost contact with their community, and may only have weekly interaction with the outside world. We see the churches’ role as central to help to people thrive in their later years, knowing they are valued and have something to offer. A community meal is a great start – but we also want churches to think of ways they can keep up the relationship beyond the day." The resource is available for free download from www.livability.org.uk/makeamealofit.